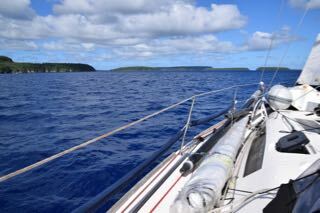 On the 1st of June we entered the Kingdom of Tonga and the Vava’u Group in the Northern part of Tonga. 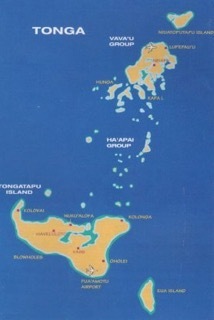 Polynesians have lived on Tonga for at least 3,000 years. 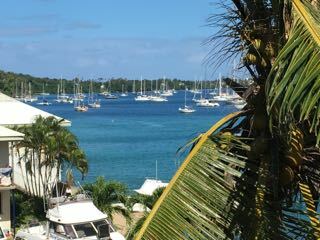 The Dutch were the first to explore the islands, landing on Tafahi in 1616. 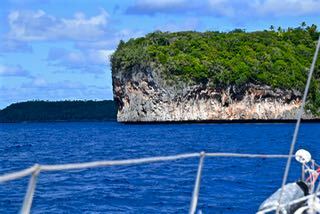 British explorer James Cook landed on islands in 1773 and 1777 and dubbed them the Friendly Islands. 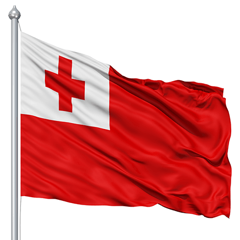 Tonga is still governed by a royal family and is the only islands in the Pacific that has never been colonised. However once approaching the islands they do appear being a bit more dramatic than home. 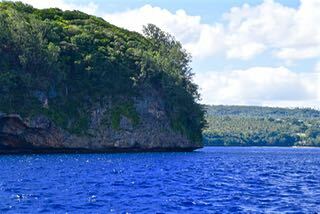 After the clearing in procedure with the customs and the health authorities we anchored in the Bay of Neiafu, the Capital of the Vava’u Group. 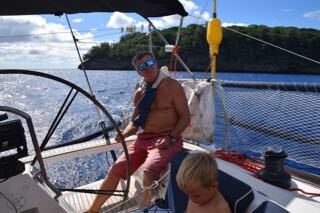 As soon as we had anchored we received a call on the VHF from Sam and Matthew asking if the kids wanted to play Risk with them… Alex and Inez were very quick on jumping in their dinghy as soon as they docked Take Off! 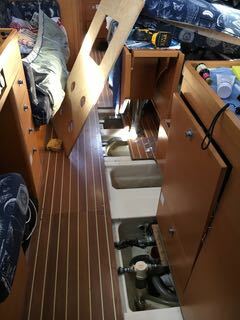 Suddenly our maintenance hours on the boat seemed so much easier to proceed. 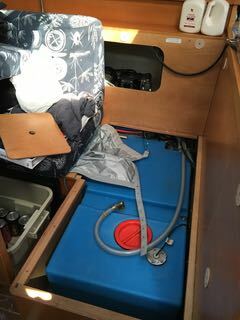 We hit directly on finally trying to find the source of the fresh water leakage in the bilges. it remains still a mystery. 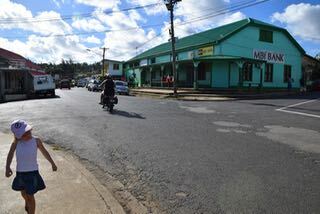 We then went ashore and walked through the town of Neiafu. We first passed a beautiful Catholic church. 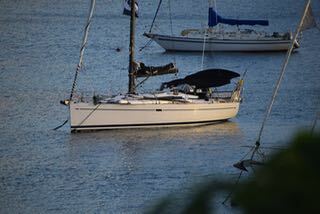 The day after, our fist morning in the bay, we woke up at 6 am by clear singing voices from the church. We asked the church what kind of ceremony it was. Well every morning from Monday to Saturday at 6 am they have a church ceremony before starting the day. So we decided the day after to attend the ceremony. Everyone has to be covered, shoulders down under the knees. 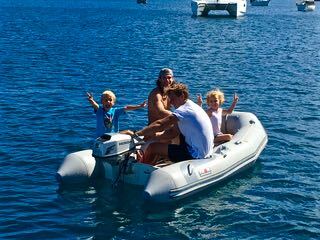 We woke at 5.45 am, still pitch dark outside, took the dinghy to shore while the kids were still sleeping and went to church. What a sight! All ages, families with small sleeping kids and youngsters: all attended the church and … sang beautifully! Lovely start of the day. 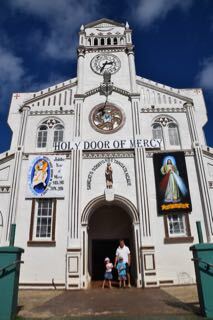 We understood later on that visiting a church on a Sunday is a treasured memory visiting the Kingdom of Tonga. Sundays are devoted to church, family and rest. Ceremonies with beautiful clear singing voices, the ringing of church bells and the rhythmic beat of the Lali (wooden drums) are all familiar sounds drifting on the tropical breezes. 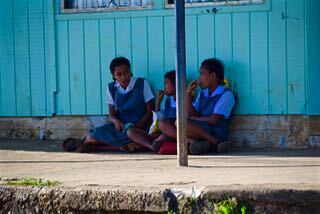 From the days of the early missionaries until modern times, Christianity has been a vital and influential aspect of Tongan life, second only to the respect for family. 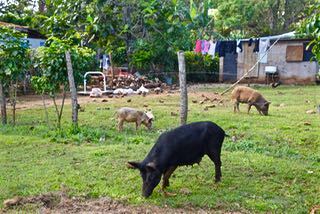 Modest dress is necessary for both Tongans and visitors . It is expected that visitors respect Sunday as day of rest. 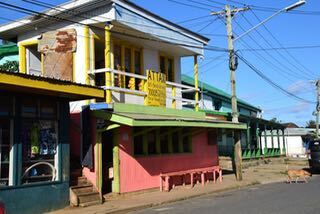 Businesses and shops are closed by law allowing Tongan families to spend the day attending church for a relaxed day of worship and feasting. No flights are scheduled, and business contracts signed on a Sunday are legally void. It is a very respectful day and sports activities are not permitted, even in rugby-mad Tonga. 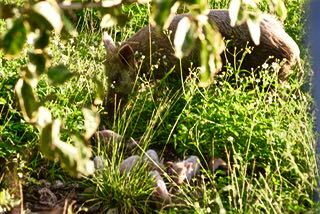 We continued our walk through the small town finding wandering pigs everywhere. 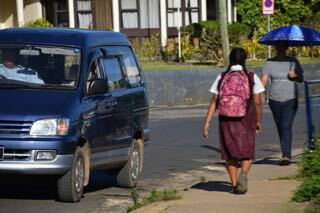 School girls taking a crips brake before heading home after school. 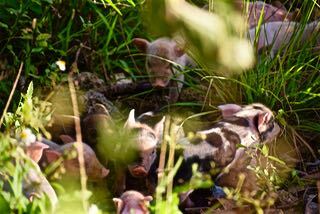 Leaving the town we heard strange noises on the side of the road and found a sow with at least 7 or 8 piglets.